I didn’t take the most direct path to nutrition, but I finally got here. Below is the timeline of my experiences that have culminated in the development of the nutrition principles I incorporate into Perfectly Produce and our CARE Weight Loss and Lifestyle Program. My curiosity for nutrition formed during high school while running cross-country and track. I didn’t formalize that interest until working in publishing for several years after college. Along the way, I loved experimenting with various popular diets but it was my graduate and research training that allowed me to evolve and learn how to only apply recommendations that are evidence-based and very importantly –sustainable for a lifetime. High school: I ran cross-country and track; my mom home-cooked meals almost every night (and made me help) which I will forever be grateful for (even though I was far from grateful at the time); this was my introduction to whole foods-based nutrition. College: I stopped running competitively and gained 25 pounds; my experimentation begins: I started yoga, became lacto-ovo vegetarian, progressed to vegan, began eating for my dosha (Ayurvedic Indian medicine). Yet, my triglycerides spiked to 700 (yikes!) even though I was young and highly active (this was my introduction to how vegetarian shouldn’t = ‘starchetarian’). 1997-1998: I worked as a store manager for Starbuck’s in Chicago; my diet was simple – incredible amounts of caffeine plus broken pastries 6 days a week, gained 20 lbs; this was my introduction to blood sugar control (and what it feels like when it isn’t!). 1998-2003: I was in “The Zone” (most of the time); weight still fluctuated (so frustrating!). 2003-2005: I integrated the Blood Type Diet with the Zone; I’m Type O so was essentially Paleo and gluten-free, but I still felt anxious and unable to adapt to stress; my weight continued to fluctuate. Amidst all of this “failure,” I gained an insatiable appetite to solve the puzzle. Why wasn’t anything working? So I enrolled in graduate school. 2005-2008: Completed my clinical nutrition and research graduate program at Bastyr University; I was awarded funding to lead research studying the various factors that affect chronic inflammation in our bodies; I elected to go through more extensive culinary training which included classes such as “The Therapeutic Use of Whole Foods” and “Whole Foods Culinary Design”; through these classes, I learned how to use whole, real foods to heal the body (culinary medicine) without sacrificing taste. 2009-2010: Completed my 900 internship hours (required for licensure) and started Perfectly Produce out my desire to make a whole foods, produce-based diet doable; I evolved to the beautiful simplicity of eating whole foods (all of them), in the right amounts, at the right time; (finally) stabilized my weight and increased my adaptability to stress. I learned why and how to use lifestyle as medicine. Today: Now, I want to try and help ease your path by applying what I’ve learned from my own – both formally through my training and informally through trial and error in my own kitchen. I am only a nutritionist part of the time. I, too, face my own life stress that tempts me to make the easy choice instead of the right choice. It’s this vulnerability that drives me to continually work to discover a sustainable approach to lifestyle as medicine. I thrive in the CARE community and love celebrating every win with others who experience the same powerful, life-changing results. MEDIA FEATURES can be viewed here. 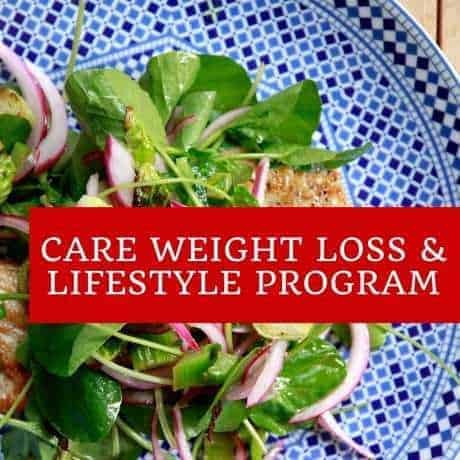 Read more about setting weight loss goals and expectations for your own rate of weight loss in CARE here.